Our team effort not only satisfies our clients, but it also creates opportunities to work with other offices in the United Country family. United Country Real Estate, headquartered in Kansas City, Mo., recently announced that Mason Morse Ranch & Farm Company of Glenwood Colorado was the No. 3 franchise in United Country’s international network of nearly 550 offices for 2011. 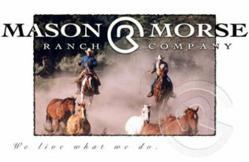 Over the course of the last 12 years, Mason Morse Ranch & Farm Company has served clients all across the western United States in marketing ranches, farms and large land holdings of both the national and international variety. A strong team is one of the keys to their success not only in 2011, but over the entire tenure of their company. The company’s agents offer their clients more than 133 combined years of experience in ranch farm and land sales across the west. Miller's team includes broker associates Robb Van Pelt, Rue Balcomb, Linda Niebur, Karen Mikkelson, John Stratman, Ted Schaal, Dave Banzhaf, Michael Landreth, Mike Lafortune, Roger Dryden, Bill George, and staff member Kay Muller.